We were not planning to go anywhere near the 405 freeway this weekend. Instead we headed in the opposite direction to Ventura and spent the day with the pirates including Capt. Jack Sparrow. The pirates entertained us with sword fights, action shows and sing-alongs. The treasure hunt and visiting exotic birds are fun too. The kids also really enjoy getting ice cream at Coastal Cone and playing some games at the arcade. It's also a great escape from the heat although it has not been terribly hot these days. Escape Carmageddon and see some pirates! Pirate Days, Saturday & Sunday, July 16-17, 1 to 4p.m. 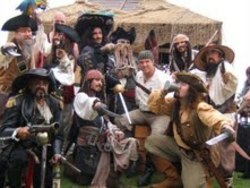 : Return to the mystical times when the pirates roamed the seas during the 6th Annual Pirate Days Festival. The event features professional pirate live-action shows, pirate themed activities, magic shows, treasure hunts, pirate costume contests, pirate vendors and much more. Admission is free. Free shuttle parking available on Harbor Boulevard.